Play the Growing Old Gracefully Game! We’re going to play a little game. 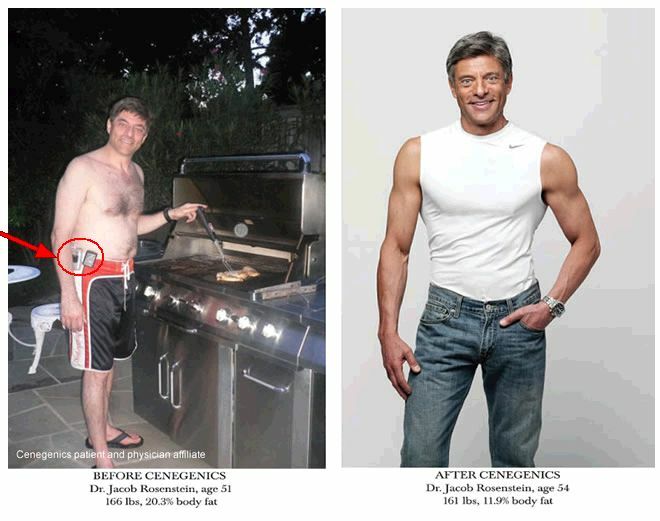 Take a look at these before and after photos visually extolling the remarkable results of the Cenegetics healthy aging program. I see commercials for Cenegetics frequently enough to question my television habits and the last time I caught their ad something caught my eye in the pictures above. Something is wrong. Can you find it? Keep reading for the big reveal. Take note now, fellas, as you begin your respective descents into old age. You don’t have to have the bod of a 26 year old, or wax your arms to stay attractive. But avoid at all costs the electronics-on-the-belt look. And don’t give me that “I’m a doctor, I need my pager” spiel. If you’re really a doctor you can find swim trunks with pockets. This entry was posted in Gadgeteering and tagged cenegenics, games, photos. Bookmark the permalink. that’s how you KNOW it’s not him in the after picture. he doesn’t have his pager, let alone his phone AND pager, comfortably snuggled against his waist. and there definitely aint room in those pockets. maybe room for a banana…if you know what i’m sayin’. that really is a statement. do you know how uncomfortable the plastic clip is when fastened to swim trunks with elastic? what commitment!!!! by the way, these ads have always creeped me out.